As the name suggests, these string ensembles are quite simply, passionate. Their lush, broad and emotive cinematic sound defies expectations for a virtual instrument. They integrate perfectly well into a variety of musical styles, from pop and rock environments to symphonic arrangements, from emotional ballads to film scores, from pure string beds to complete orchestral works. Appassionata Strings I offers various facets of sustains and Legato Performances with different intensities of vibrato as their main focus, but also include articulations such as sul-G-Performances, accented interval notes, spiccatos, staccatos, various Repetition Performances, trills, runs, and much more. They also include “out-of-tune-samples” where various players of the ensemble carefully correct their intonation as the tone progresses. Mirroring what actually happens in live orchestral performances, this is a very effective technique for creating heightened realism and expression. The bass section of Appassionata Strings I consists of 6 five-string and 4 four-string basses, giving the low end a deep and rich flavor. This is the one Vienna fans have been waiting for. Though the string sections in VSL's Pro Edition library and Orchestral Strings I & II Vienna Instruments are beautifully played, exquisitely sampled and turn in a broader range of performances than Peter Sellers in his heyday, they have been said to lack the requisite lush, romantic 'instant Hollywood' sound. VSL have addressed this by recording Appassionata Strings (AS), an 18GB (12GB when installed) set of large string ensembles designed to provide a more overtly emotional, wide-screen listening experience - less European art film, more Titanic. 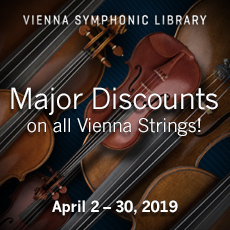 A substantial chunk of this title's 20-player violin section's samples was made available last year, as a free bonus to registered owners of VSL's existing strings. The 20 fiddlers are now joined by 14 violas, 12 cellos and 10 double basses. Having been scaled up from the Pro Edition's 14/10/8/6 format, the new sections make a correspondingly bigger sound, and approximate the number of strings used in a full-scale orchestra. As with all VSL projects, the recordings were made in the relatively dry acoustic of the company's Silent Stage - if you want a concert hall sound, add your own reverb! All four of the AS string sections have a full, beautiful, sheer sound. Unsurprisingly, the new violins sound more lush than VSL's original 14-piece section and, as the name suggests, they play with a stronger, more impassioned vibrato, which is emotional and engaging without sounding mawkish. The 'progressive vibrato' delivery is very nice, adding timbral and dynamic mobility and making this attractive section sound even more expressive. The 12 cellos' tremolos and pfp samples are gorgeous, and their monophonic performance legatos (interval-specific sample sets optimised for the creation of smooth melody lines) are toe-curlingly good. The violas sound equally sumptuous, their rich sound and wide range making them an inspirational patch for composition. If compared to the double basses in Orchestral Strings II, the AS bass section wins out in all areas except the pizzicatos, where they sound somewhat less punchy. The AS basses' menu of styles is relatively limited and, unusually for VSL, no performance legatos are provided for them. One nice touch is that the violins, violas and cellos performance legatos contain sinuous Bollywood-style slides, which can be instantly accessed with a keyswitch. I also liked the three-note chromatic 'grace runs' - good Tom & Jerry comedy fodder. Samples are provided which start off out of tune then gradually drift into pitch; the idea (instigated in Vienna's Brass I) is good, but for me the musical effect falls between two stools - the initial skewed intonation rules out conventional usage, but the detuning is arguably too subtle for use in horror scores. AS's creepy atonal cluster chords and chaotic 'random pizzicato' samples are a better bet for that sort of work. Getting a romantic Hollywood sound is easy with these samples, but more aggressive deliveries are few and far between. 'Harsh' performance samples are the only truly gutsy-sounding articulation here, but only the violins play them. To help busy composers, VSL have lashed together the four sections into ready-to-play 'full strings' programs, in a handful of basic styles. The Vienna Instrument doesn't permit users to create their own keymaps, so if you want to build more of these multi-section ensembles you'll have to find a workaround using your sequencer or VST host. Choosing between AS and Orchestral Strings I & II (reviewed in SOS in November 2006) is a tough call; AS's lusher sound is an obvious winner, but the latter's far greater number of articulations (which include 'fast attack' trimmed sustains, flautando, played trills, snap pizzicato, harmonics, sul ponticello, con sordino, col legno, grace notes, glissandi, scale runs and so on) is indispensable for detailed string arrangements. Buying all three collections would be hard on the pocket, but the prospect of the luxurious combinations they can produce is mouth-watering. Need a piano to go with your orchestra? Then you should definitely check out VSL's new Bšsendorfer Imperial Vienna Instrument, which weighs in at a hefty 36.7GB (installed size). The instrument (a Bšsendorfer 290 nine-foot grand) has 97 keys and spans eight octaves. To be honest, it's hard to discern the pitch of the sub-bass notes below A0, but they certainly make an exciting, thunderous rumble! This piano is characterised by an open, clean and stately sound and a very clear attack which is discernible at all dynamics - even the quietest notes speak clearly and distinctly. This clarity would be a great asset when playing the precise mathematical inventions of JS Bach, negotiating the dense note-blizzards of a Rachmaninov piano concerto, or for making sure the instrument stays audible in a full orchestral score, but it might be a handicap when it comes to the more ambiguous, lyrical and intimate sonorities required for solo piano jazz improvisation. Either way, I was impressed with the way the samples respond smoothly and naturally to the touch, with no obvious jumps between the seven dynamic layers. VSL have dealt with the notoriously difficult problem of replicating the effect of the sustain pedal by sampling a full set of 'pedal down' samples at seven dynamics. Since you can use any controller to switch between articulations, it's easy to set up a patch in which pressing the sustain pedal accesses the pedalled samples, but unlike on a real piano, you won't hear the effect until you play the next note. If you prefer a softer, less focused piano sound, a more distant miking with less obvious stereo imaging is also provided. The precise, formal sound of this superior instrument lends itself to orchestral arrangements, and the identical recording conditions guarantee that it will blend well with VSL's other instruments. Committed Vienna collectors will buy this without hearing it, but piano sound being such a personal thing, I'd strongly advise checking out the demos on VSL's site before you buy. ein bisschen schwieriger zu verarbeiten als die Orchestral Strings - liegt aber sicher am Musikstück ! sehr gute Qualität der Samples ! !